Have you been an ardent lover of beer? Do you want to taste best brews of the country? Then, you must book a seat in the 12th Annual Chillin ‘N Swilling Beer Festival that takes place on 5th of November between 2pm and 6pm. To this charitable event, people come from different parts of the country to satisfy their taste buds. In the festival, the vendors are allowed to showcase their best products without any entry fee. Money collected from the event is generally offered to the local charity for social welfare. Last year, the authority has managed to donate $ 30,000. And it has been made possible due to generosity of the sponsors as well as the attendees. By joining in this Annual Chillin ‘N Swillin Beer Festival that has been arranged for the last 11 years, you can do a little bit of charity. In addition, the event certainly gives you an opportunity to enjoy your life in optimum manner. So, don’t you like to thrill yourself with beer now? For group of friends, it is ultimate place to strengthen bond over beer. More than 40 premium beer of handcrafted nature is showcased in the festival. By choosing one of these finest beers, you can easily get a taste of heaven. On the occasion, you can talk to old friend or make new friends also. As a perfect accompaniment to the beer, you can be offered delectable food items. Some of the local cuisines can be tried from the nearby places also. Through live music, mood of the festival is generally brightened further. While holding a mug of beer, you can dance to the tune of vibrant music. If your partner is by your side then your enjoyment may not have any bound. From this casual gathering, you can get pleasure and thrill of your life. For relaxation, blanket and chair is offered also. It is certainly a fun time. If you decide to visit the festival then tickets must be booked before time. From the Mudshark Brewing Company, Barley Bros, The Office Cocktail Lounge and College Brewhouse and Pub, you can easily collect your tickets. Through advanced booking, tickets can be obtained at the price of $ 25. However, tickets can be obtained from the gate as well at the price of $ 30. Following to the party, it may not be safe to drive alone. Therefore, you can get a designated driver from the site also at the price of $ 10. On the gate, you may have to show identification card of valid nature as people under the age of 21 is not allowed in the festival. Date and time of the Beer Festival can change. Therefore, it is better to stay in constant contact with the event coordinator for necessary information. The venue for the festival is fixed at Park Ball Fields of Rotary Community. 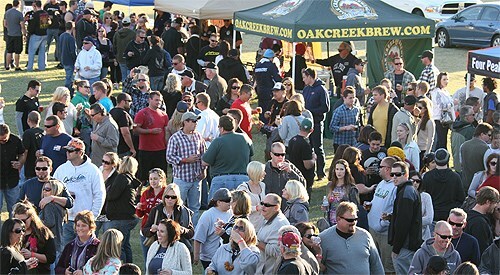 Thrilling experience is ensured with the 12th Annual Chillin ‘N Swillin Beer Festival. In the festival, you can drink as much as you can. There is no one to stop you from this fun exercise.